Xanterra Parks & Resorts is the largest national and state park concessioner in the United States, their operations span the country from the wilderness of Ohio’s state parks to the stark desert of Death Valley. The company’s legacy in the hospitality industry extends more than a century, back to when the Fred Harvey Company began providing quality hotels and restaurants for weary travelers making their way West. Since its inception, the company has held environmental sustainability as a core value, which runs from the boardroom, to each and every one of the guestrooms and dining rooms that they manage across the nation. Under the leadership of Chris Lane, Vice President of Environmental Affairs, the company has realized tremendous strides in its environmental performance. Over the past nine years, Xanterra has won 52 awards for its environmental performance. and their largest environmental project to date – a one-megawatt solar photovoltaic system at Death Valley, which has reduced their greenhouse gas emissions by an amount equivalent to the emissions of a small city. I recently had a chance to meet with Chris to discuss Xanterra’s unique environmental goals and challenges – here are some excerpts from our conversation. JS: The properties that Xanterra manages span geographically from Ohio to California. Most management agreements are third-party management contracts, while some properties are wholly owned by Xanterra. Some facilities have been recently built, while the majority was built over the past 70 years. Some properties operate year-round, while others only operate on a seasonal basis. What challenges do you face as you implement global sustainability solutions across such a diverse portfolio? CL: Where do I begin?! Considering that in most cases, we are operating as a third-party manager, it is sometimes difficult to get the ownership’s buy-in on making capital investments to upgrade facilities. Also, considering that most of the facilities we manage have been in operation for decades, we rarely have the opportunity to influence the design and construction process – we simply have to play the hand we’re dealt. Where we have been able to impact the design and construction process, we have done great things. For example, we recently built a LEED Silver restaurant and retail outlet at Crater Lake National Park, and a LEED-certified employee housing facility at Yellowstone National Park. Regardless of a facility’s inherent physical challenges or our limited ability to influence capital expenditure, our internal systems and procedures allow us to make the best of a challenging situation. Our Ecologix program provides a framework for continual improvement of our environmental performance, compliance with applicable regulations and policies, and it ensures that sustainability is a core objective of our management’s best practices. This adaptive framework allows us to maximize environmental performance regardless of unique physical characteristics or operational challenges. It may sound clichéd, but such a broad array of challenges means that we can experiment with a wide range of solutions, and apply newfound best practices to other properties that might benefit from a particular solution. 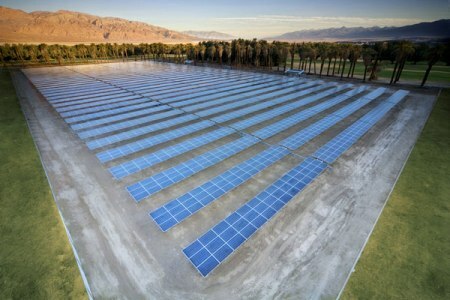 One-megawatt solar array recently installed at the Furnace Creek Inn and Ranch at Death Valley. JS: You mentioned capital expenditure, which is a particularly touchy subject in today’s marketplace. How has the economic downturn impacted your ability to allocate capital to projects that enhance a facility’s environmental performance? CL: In a marketplace like today that is fraught with uncertainty, we have had to be very selective about which projects we invest in, and we have to be increasingly efficient with our operating budgets. Many of the low- to medium-cost environmental upgrades can be integrated into operating budgets and standard operating procedures, while more capital-intensive projects have to be planned years in advance. Right now, for example, I’m planning projects that probably won’t be funded until the first quarter of 2011. Not surprisingly, the easiest projects to fund today are those that have a quick financial payback and help us reach our sustainability goals efficiently. JS: What advice would you give to a hospitality company looking to improve their sustainability performance? CL: Don’t underestimate the value of strong internal communication. A well-articulated sustainability vision that is effectively disseminated throughout the entire organization from the CEO to the housekeeping staff is the first step in reaching any sustainability goals. Strong internal communication has been a major factor in reaching our high levels of environmental performance. Everyone in our organization clearly understands what our environmental goals are, and understands how and why the systems and procedures we put in place help us reach those goals. Without having this type of internal commitment in place, you’re doomed, regardless of how many capital investments you make. The unwavering commitment of our CEO, Andy Todd, coupled with comprehensive initial training, ongoing site-specific training, and a dedicated on-site champion at each property has enabled us to foster an internal culture focused on sustainability. The culture that we have built over time has played a major role in our environmental performance. JS: I imagine that creating such a culture does not happen overnight. CL: Like any other exercise in building trust, it takes time. I would say that it takes at least two to four years to build this type of culture within an organization, depending on the company’s current level of environmental commitment. If a company has historically not held sustainability as a core value, many stakeholders, both internal and external, will view a newfound interest in sustainability as a response to the recent attention that environmental issues have had in the media. If they consistently hear the same message over time though, stakeholders will gradually begin to trust that the organization has a genuine interest in reaching sustainability goals and is not simply trying to capitalize on a market trend. JS: What’s next for Xanterra? CL: We’re going to continue to aggressively pursue the development of on-site renewable energy systems, find innovative ways to divert waste and reduce our fossil fuel consumption. The one-megawatt solar array we installed recently at the Furnace Creek property in Death Valley was a major step toward reaching our goal of having 7% of total electricity consumed companywide to come from renewable energy sources by 2015. We have also had great success with reusing vegetable oil from our food and beverage operations to make biodiesel on site to fuel vehicles and heat buildings. At Yellowstone National Park, we have even plumbed used cooking oil directly to our domestic hot water heating system, which has resulted in a savings of more than 12,000 gallons in our fossil fuel consumption there. To celebrate the 20th anniversary of the re-inauguration of the Grand Canyon Railway, which originally began operation in 1901, a vintage steam-powered locomotive fueled by recycled vegetable oil will make a 65-mile round trip journey from Williams, Arizona to the South Rim of Grand Canyon National Park. Reusing cooking oil is a great way for us to meet several of our environmental goals, namely to divert waste and reduce our consumption of fossil fuel. We’re excited about experimenting with other innovative ways to reduce the environmental impact of our operations. We are confident that with the combination of our Ecologix framework, our Environmentally Preferable Procurement (EPP) program, and our well-trained staff, we will able to reach our aggressive sustainability goals and continue to set the bar for environmentally sustainable operations in the hospitality industry.